The last couple of weeks have been very busy as we prepare for the end of the school year, and our youngest son's graduation from high school. My daughter will be graduating with her two year degree this mid June as well. So we have a very busy upcoming couple of weeks. 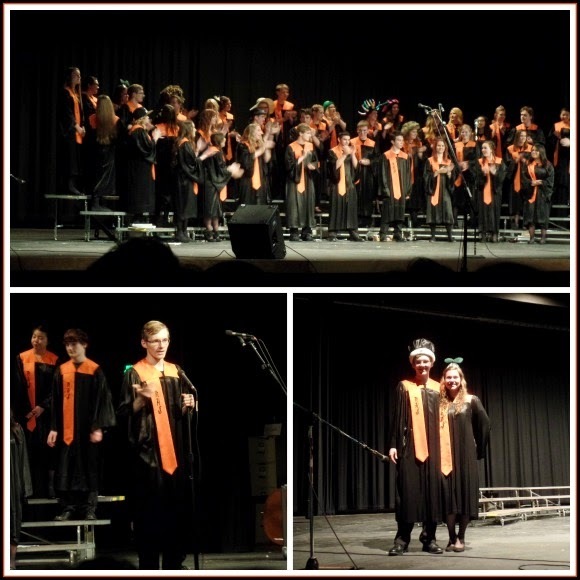 Last week we attended my son's last choir concert. He performs with the concert choir and Socialaires group which is similar to a Jazz choir. Between my son and daughter this is our 6th performance, and I look forward to the spring concert every year. The music selection is wonderful, both classic music, and fun contemporary music. The choir teacher is a wonderful teacher, who all the kids love and respect. I will definitely miss this event! 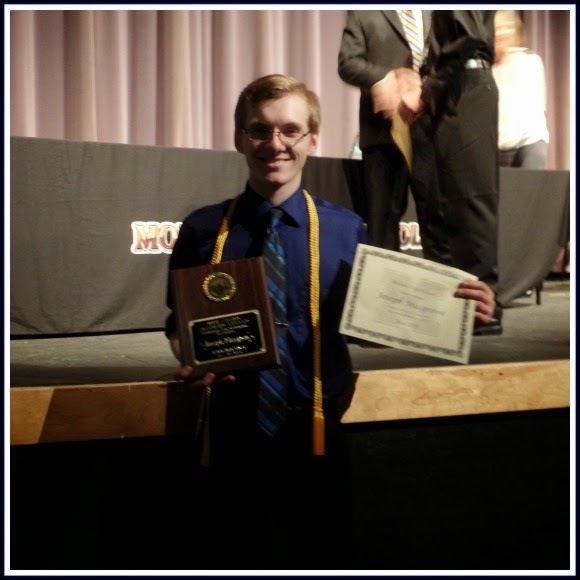 We also attended Senior awards night, my son received his academic letters for every term and gold honors cord for graduation. Great job Joe!! Last Tuesday we hosted the teen girl's bible study, and I thought I would share the dessert I made. We have been so busy the dessert had to be quick and easy, but I still wanted it to be yummy. 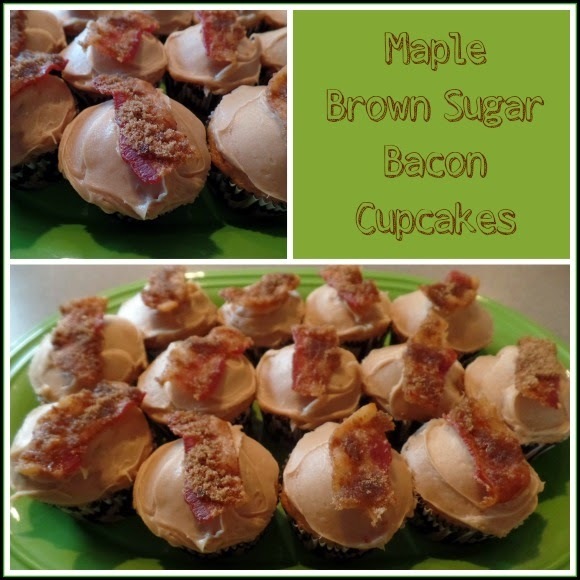 I had purchased a Brown Sugar Maple Cake Mix and Frosting this past fall that was in my pantry and I thought that would be perfect topped with my brown sugar bacon. The bacon turned out delicious and was great on the cupcakes, I think this bacon would go well with any spice or caramel/brown sugar flavored cake. For my gluten free guest I kept some larger pieces of brown sugar bacon on a separate plate and topped them with a little bit of the Maple frosting which happened to be gluten free. Everyone loved the dessert! Then Thursday arrived, and it was time for my son to head off to his choir tour to San Francisco. 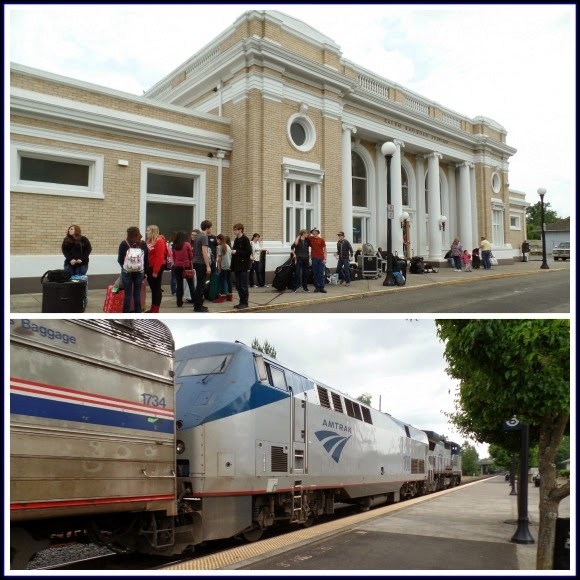 The train station was about an hour away in Salem, Oregon. This was the first time my son had been on a trip by himself, he was very excited, and I was nervous, but excited for him to be able to go on such a fun trip. The train station was much smaller that I thought it would be, and the building was really beautiful. 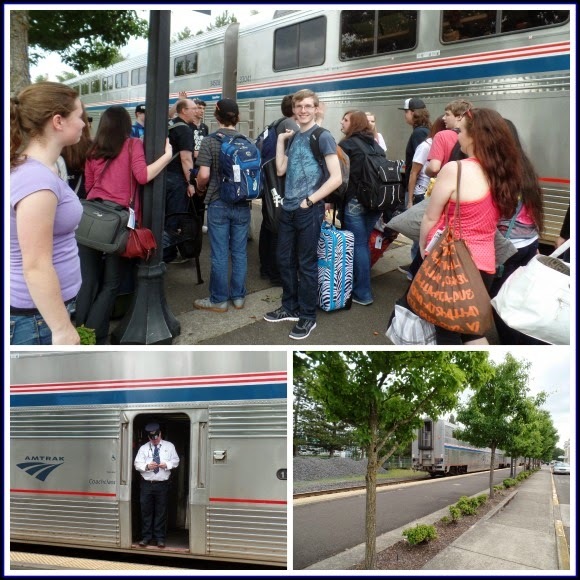 I thought it was nice that he was departing from Salem rather than the very busy Portland station, it really made it less stressful I believe. We even got to wait for the train to arrive and see him off. He turned around to get a goodbye picture and one more goodbye for his girlfriend and family. Then his train departed and we waved goodbye. I finally got to talk to him tonight, he had just finished spending the day at Great America and went on every ride and loved it. Tomorrow he will tour San Francisco a bit more, then head home in the evening for a very long train ride back home. I look forward to hearing all about his trip! 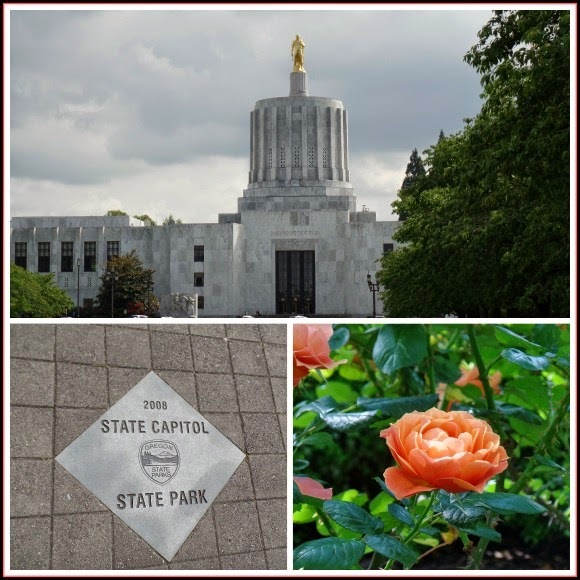 Since we were in Salem, after we dropped Joe off at the train, we realized we were right around the corner from the state capital, the rose gardens were beautiful, so we decided to stop and walk around a bit before we headed home. 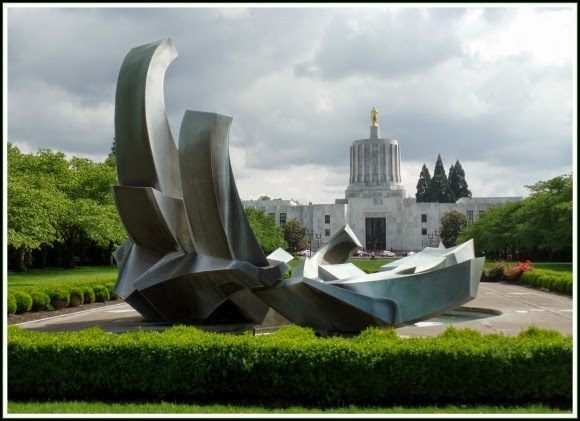 The Oregon State Capital park is full of beautiful trees, and roses, as well as a really neat looking sculpture, and is surrounded buy beautiful architecture. 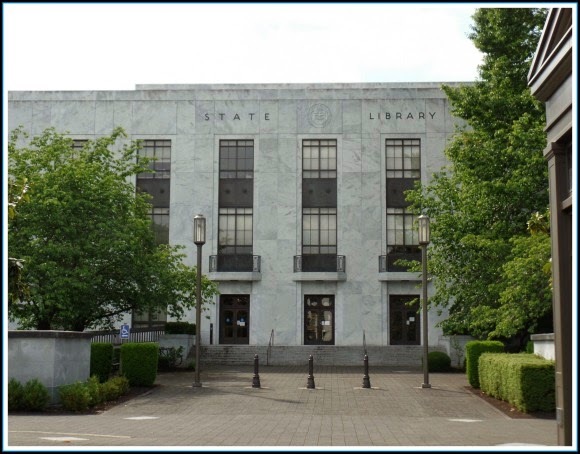 I hadn't been down to the state capital in years, and had forgotten what everything looked like. 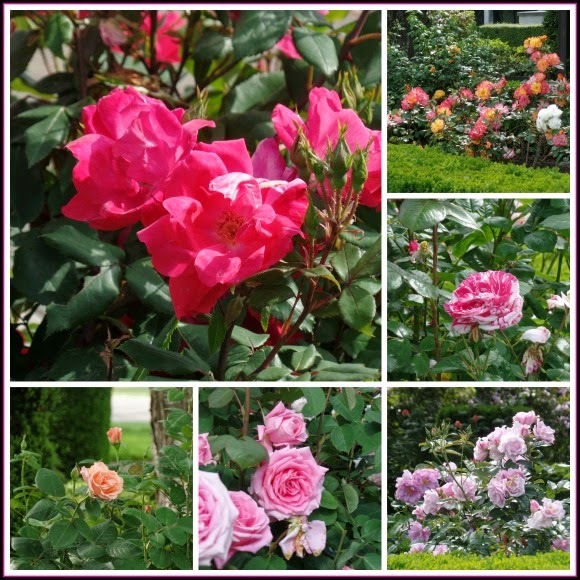 The roses were all in bloom, which was a real treat. 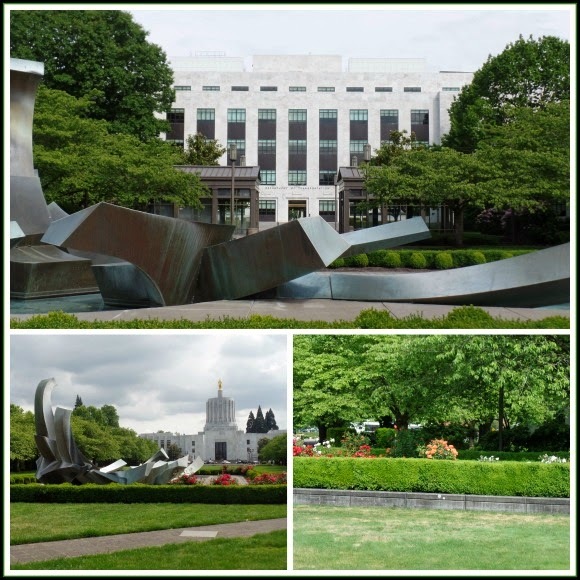 Right now Portland is celebrating the Rose Festival and we are usually too busy this time of year to attend, or to get out to the Portland Rose gardens, which I really enjoy but haven't been to in years. So I was glad I got to walk through this rose garden at just the right time. 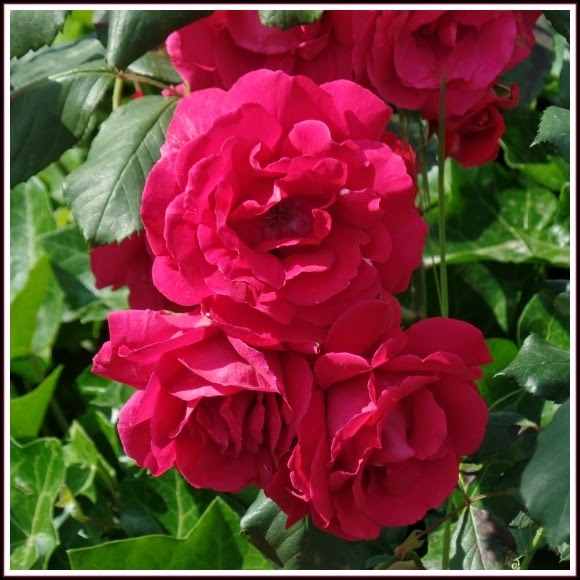 The roses smelled wonderful! 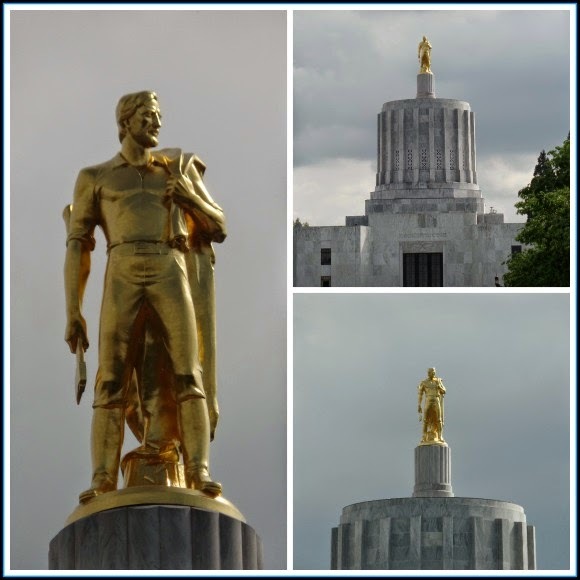 Here is a close up of the Gold Oregon Pioneer which sits on top of the capital building. I think it looks really pretty against the slightly grey clouds with the sun shining on it. 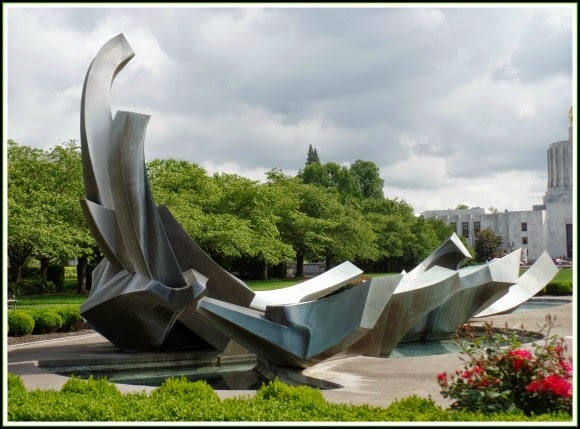 I vaguely remember learning about this statue as a grade school student. The State Library building was right next to the garden, we popped in for a bit but the book room was closed. Very pretty building though. 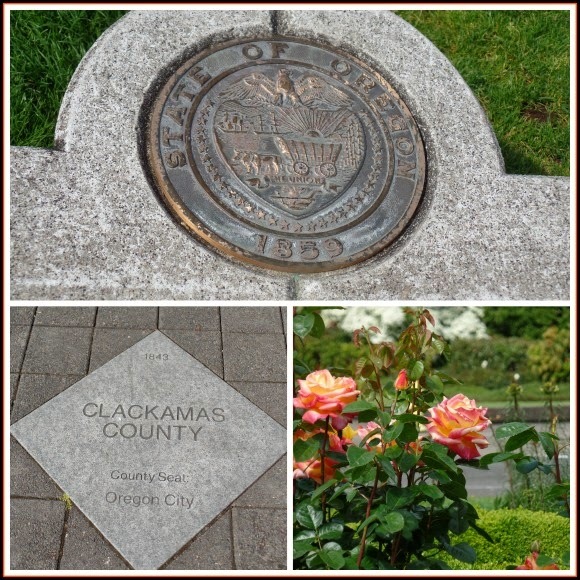 Throughout the garden are paving stones and stones with the different counties listed, we finally found our county- Clackamas County, and then realized they were laid out in alphabetical order. I really loved this huge sculpture and how it looked from every angle. Around the base of the sculpture was a pool of water, definitely a nice park to walk around, lots of beautiful things to see. We had to head home after a bit, but we all agreed it would be fun to come back and explore some more. I am looking forward to my son returning from his trip and hearing all about his adventures. Next week will be equally busy, between my surgery, my son's last school play, then onto graduation, we will be one busy family! Enjoy this time of life, April. It's always so satisfying to know that your children are growing up to be independent.